For the purposes of barcode scanning, the target field can also be a text field — the decoded barcode gets inserted in the text field. We still believe that a hardware scanner is still faster and more accurate than scanning with the camera on a device. We sell a wide variety of Bluetooth barcode scanners, as well as RFID readers that work with FileMaker out of the box. http://store.zerobluetech.com. I’m considering using FMP13 to extract text from many documents which I have scanned (PDFs) that integrate in an area thereof, barcodes. Is it possible to introduce these PDFs in a container field and can recognize such barcodes? Or you need to use Filemaker Go and Camera iPhone / iPad to do this? You might be able to accomplish this with a plugin. I saw might because I have not tried it, and so I don’t know for sure. There are at least two plugins that I know of that let you work with PDF content. One is Monkey Bread Software‘s plugin, the other is from Productive Computing. The latter lets you download a trial so you can test what you seek to accomplish. Thanks Anders. The first of what you mention me too expensive, and its functionality is limited, as it requires making image cropping to recognize the barcode. And the second is not particularly solves what I need. For now, I renounce it. However, thanks for your directions. Sorry it didn’t work out, Ric. It seems like a tricky and unique scenario. Great info and articles. Thank you! Unfortunately, the new FM 13 does not support scanning of PDF417 barcodes directly, which are often used at trade shows. So is it possible to help me by updating your older article series (Scanning Barcodes and More with FileMaker Go) so that FileMaker Go works with an app called PDF417 by PhotoPay (http://pdf417.mobi) or Barcode Scanners by Manatee Works, Inc. using the Open URL script step? Just can’t figure out how to get either of these to work. Jason – As you mentioned, FileMaker Go 13 does not support scanning PDF417 barcodes using the Insert from Device script step. An alternative is to use a Bluetooth scanner with the iOS device. The following link is a list of barcode scanners that work with FileMaker Go from ZeroBlue. PhotoPay just released a Pro version of PDF417.mobi app that can scan PDF417 barcodes and supports custom URL scheme. Here is the app and here are the docs. Disclaimer: I work for PhotoPay. Sasa – Thanks for sharing the iOS app. One question, out of the list of barcodes types that can be used, which one would you say is the easiest & fastest to be read from an iOS device (iPhone or iPad)? If scanning speed is important, you may want to consider a separate Bluetooth scanner. How about the creation of the bar code itself? I had been experimenting with a single seat plug-in (https://www.peninsula-group.com/barcode_filemaker/default.html) running on my v12 server. I’m about to migrate to FMPS-13, and this plug-in is not 64 bit, so it will not work. What is the best practices solution for creating the printable barcodes in the 1st place? 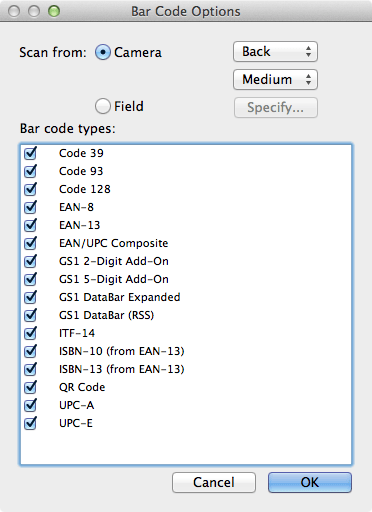 Alan – Other options to generate barcodes are the FileMaker plugin or iOS app from CNS plugins. Unfortunately FileMaker Go 13 still has no way to give audible cues as to what was just scanned. There is only the ‘beep’ command, for which there is not even a volume control. 2D (aka QR) codes you can generate with Google’s Chart API. Louis – A couple of ways around this limitation are to use a Bluetooth barcode scanner or the CNS Barcode app. In the meantime, please submit this as a feature request to FMI. Does anyone know how to use the front camera instead of the back? 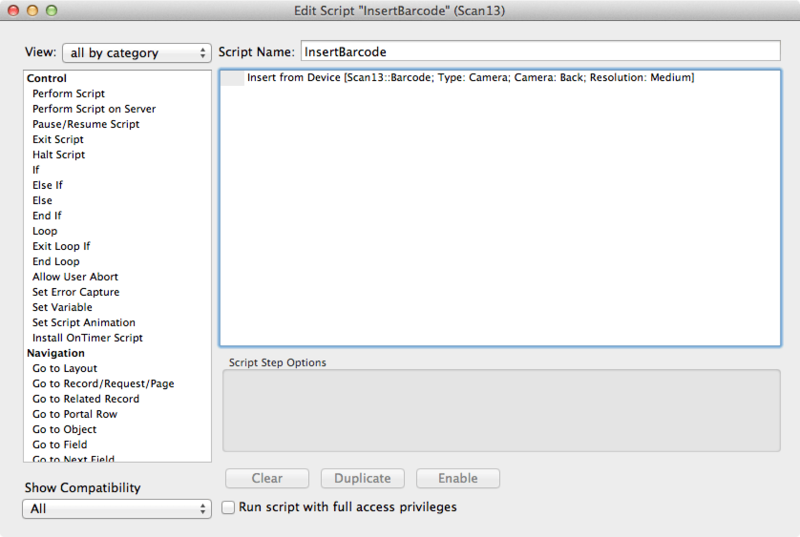 Bernard – In FileMaker 13, you can specify which camera you want to use for the Insert From Device script step when you specify “Insert Barcode”. Hi there! It is just fine to scan a barcode within FMpro13, … but what about generate it? I’ve heard that with FMpro 13 you can generate native barcode (without any font or plugin). How does it work?